The weather has turned crisp, while the aspen leaves are golden, turning to brown. There is wood smoke in the air and a fire in the woodstove. The darkness comes sooner. It’s a relief to come to this season. The busy-ness of the day gives way to more leisurely evenings. Instead of long days of gardening and food preserving, there are leisurely evenings reading, knitting, or spinning by the fire place. I have a few boxes of books to sweeten the long winter nights. I love to read deep into the night, with a cup of tea and something barely sweet to indulge in. Creamy pumpkin spice desserts fit well with cooler weather. 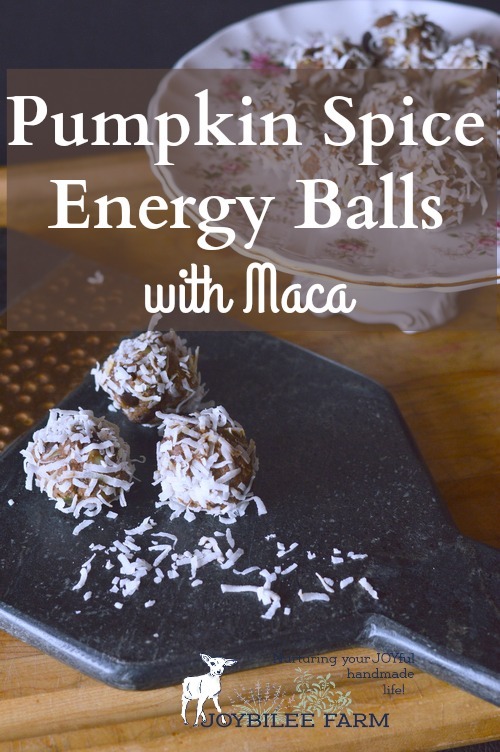 These pumpkin spice energy balls are made without added sweetening. They have just a hint of sweetness to curb your cravings, while satisfying the need for a pick-me-up in the afternoon slump. 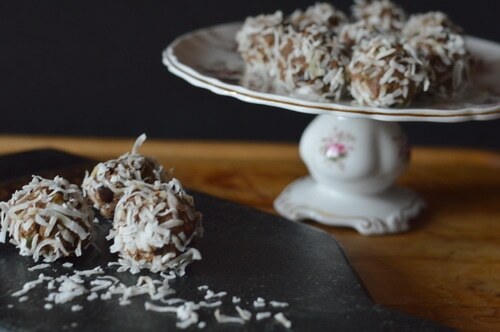 Make them in just 15 minutes. They taste better if you chill them before eating them. In a heavy skillet, toast walnuts until they are fragrant. Set aside to cool. In a food processor with a sabatier blade (that’s the basic S-shaped blade), (This is the one I love.) place cooled walnuts. Process on low until walnuts turn into nut butter. Add coconut oil and continue processing on low until smooth. Add dates and pumpkin puree. Process on low until smooth. The dough will be stiff. Add maca powder, chia seeds, and spices. Process by pulsing until just blended. Remove the dough from the food processor bowl to another bowl. Scrape the food processor bowl well with a spatula to get all the pumpkin mixture. Fold the chocolate chips and pumpkin seeds into the pumpkin mixture. The dough will be moist but not sticky. Put the coconut into a separate small bowl. Place a little coconut into the bottom of a 7 by 9 pan. Take 1 tablespoon size portion of the pumpkin mixture. Roll the mixture into a one inch ball in your palms. 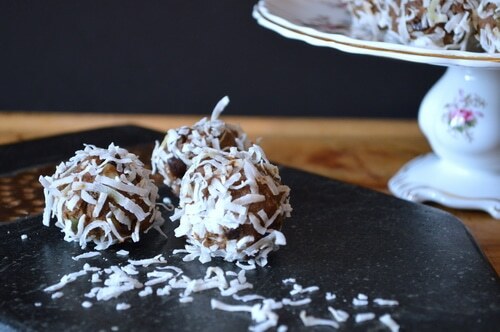 Roll the ball into the coconut to fully coat. Place the finished ball into the pan on top of the loose coconut. Repeat with the remaining mixture, placing each finished ball into the pan. Chill the pan for one hour. Serve with tea, coffee, or pumpkin spice latte. They’ll keep for a week in the fridge. Maca (Lepidium meyenii) is a perennial root vegetable grown in the high plateau in the Andes Mountains in Peru. Eaten as a staple by indigenous Peruvians for hundreds of years, it is considered a “superfood”, high in vitamin C, copper, calcium, potassium, vitamin B6, and iron. It is an adaptogen that helps your body cope better with stress. It is reported to increase stamina, boost libido, combat fatigue, and increase energy. 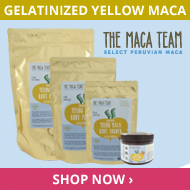 When buying maca please choose Fair Trade sources. 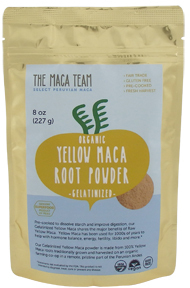 Learn more about maca here. 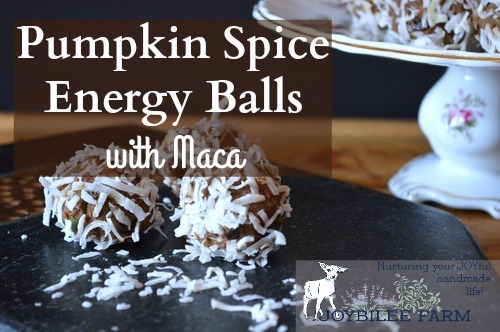 These pumpkin spice energy balls are made without added sweetening. They have just a hint of sweetness to curb your cravings while satisfying the need for a pick-me-up in the afternoon slump. Add cooled walnuts to a food processor with an S-shaped blade. Process on low until walnuts turn into nut butter. Add coconut oil and continue processing on low until smooth. Add maca powder, chia seeds, and spices. Process by pulsing until just blended. Remove the dough from the food processor bowl to another bowl. Put half the coconut into the bottom of a 7 by 9 pan and the rest into a shallow bowl. Take 1 tablespoon size portion of the pumpkin mixture and roll it around your palms until it forms a one inch ball. Roll the ball around in the coconut in the shallow bowl until it is fully covered. 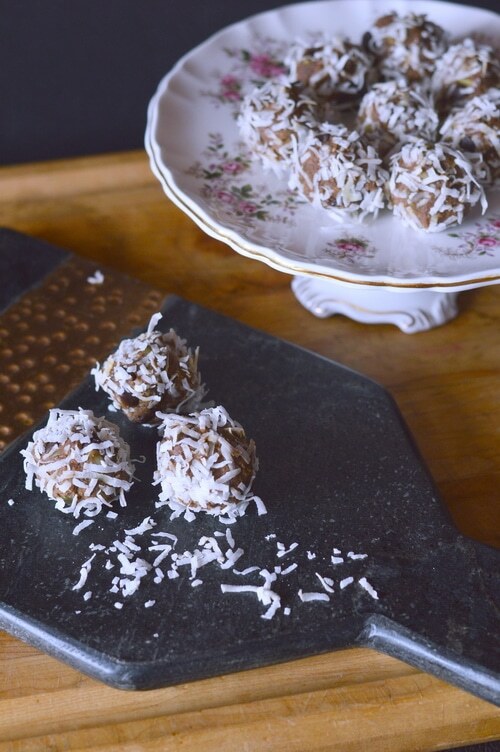 Place the finished ball into the 7×9 pan on top of the loose coconut. Repeat with the remaining mixture, placing each finished ball into the pan. Chill the pan for one hour. Serve with tea, coffee, or pumpkin spice latte.